Are you interested in becoming better at business networking? Networking is meeting an extended group of people to form mutually beneficial relationships that provide assistance and support to each other over time. 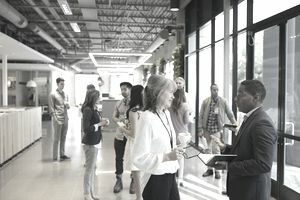 Most professionals don’t do enough networking, and their worst business networking mistake is that they don’t build a professional network until they really need one – and that’s a bit late. Harvey Mackay, who is a well-known, irreverent speaker and the author of Dig Your Well Before You're Thirsty, tells you that networking is a full-time job no matter your career or business. And, his most significant tip is that you want to have a professional business network established long before you need a network. You can become a magnet which attracts people and resources if you invest the time and energy necessary to develop a strong network of contacts. Business networking requires a leap for many professionals. Depending on your personality, meeting strangers and greeting people that you hardly know can be stressful and even - scary. Walking into a group of strangers, extending your hand and introducing yourself can be daunting for many. Others love the experience of meeting new people and plunge into business networking events with elan and skill. No matter where you fall on this continuum, you can improve your networking skill and comfort. It’s worth it for your career and for the opportunity to give and receive assistance. You can effectively network and, in the process, create these results. Build a network of partners to keep an open eye and ear for new opportunities for you, and vice versa, you for them. Networking is only effective when it is mutually beneficial. Reach targeted individuals for your business or career in two ways: directly or indirectly through your contacts. Expand your network through colleagues with a reach that you cannot develop by yourself. Build visibility within your industry or profession by raising your profile. Go to every social and business gathering that you possibly can. Build visibility within your community to assist your organization to develop a reputation as an employer of choice. It will help you recruit and retain great employees. Your community will look upon you as the face of your business. Build a strong network with coworkers within your organization to accomplish work more successfully by utilizing your network of mutually beneficial relationships. Create a diverse network of people with whom you can share ideas and gain information. Nothing is as effective as bouncing ideas back and forth with another professional whom you admire. Aim for a diverse group of people from whom you can learn. Other business people and professionals have much to teach and share when an individual is open to learning and change ideas. You will contribute to charitable and community causes. Many business networking events involve fundraising or volunteering. For people who are shy when meeting new people, these are often the most comfortable events to attend. Everyone is attending for the same reason, and the event’s sole focus is not business networking. It’s an ancillary benefit of doing good. Develop an online network of colleagues with whom you can share all of the advantages cited in the first nine advantages. While worldwide is not local, it is the new networking. It is also easier for people who may be uncomfortable in a face-to-face setting. Just don’t use it as a substitute for business networking in person. You will actually make friends. The people you meet when business networking have a lot in common with you. Pursue relationships with them for not just business advantages, but to share common interests and fun. Develop an online network of colleagues with whom you can share all of the advantages cited in the first nine. While worldwide is not local, it is the new networking. Networking has never been easier than now when you can almost instantaneously begin to build a far-flung network of professional people on online social networking sites such as LinkedIn, Facebook, and Twitter. It is also easier for people who may be uncomfortable in a face-to-face setting. Don’t use online business networking as a substitute for business networking in person. Are you interested in the most important secret about successful business networking? Always remember that the most successful, effective business networking is not all about you and what the contact can do for you. Most importantly, if you focus on this secret as you approach your business networking opportunities, you will calm your butterflies and shine as you interact with new acquaintances. Removing the focus from you—how you feel, how you look, what the contact will think of you—is the most powerful networking secret I can share with you. Make business networking all about them, and you will benefit beyond your wildest dreams.